Texas District 15 would like to welcome everyone to our site. Visit as often as you like. Texas District 15 is located in southeast Houston and in the cities of Friendswood and Pearland. 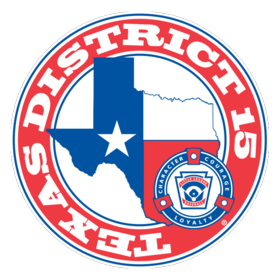 Dixie Little League was formed and chartered in 1950 giving District 15 one of the oldest leagues in the Houston area. We are one of the smallest Districts in Texas with only ten chartered leagues. But what District 15 lacks in size, we make up in heart. We not only strive to help our youngsters become better baseball players, but better citizens as well. Some of our former players have gone on to become major league ballplayers as well as city leaders and leaders of our communities. We are all proud to say that we got our start in District 15. The Taylor Hooton Foundation promotes education against the use of Appearance & Performance Enhancing Drugs (APEDs). As part of the 2015 DA/ADA Clinic, we were introduced to the story of Taylor Hooton and the cause of the foundation named in his honor. We would like all member leagues of Texas District 15 to make APED awareness part of the safety presentations made to the players, parents, managers, coaches, volunteers, and officials within the local league. The LL Southwest Region has published a page with resources that each league should review in their next board meeting and distribute to the membership. As a unified Little League District standing against APEDs, we can make a difference in children's lives in our areas. Baseball and softball are wonderful games, but as the adult facilitators, our focus should always remain on the improvement and development of the players as citizens of the community. Winning at a game is secondary to teaching kids how to succeed at life. Tonight's (5 July) 9-10-11 Section 3 Tournament has been postponed due to weather related conditions. Weather permitting, games will go forward tomorrow at 6pm and 8 pm. The 2018 - 2019 District 15 Ground Rules for the Minor Divisions District Tournament have been approved and published. They are located under the header "Ground Rules rev. 2018"